Award-winning Chinese director Xie Fei has accused his country's censorship rules of "killing artistic exploration" in an open letter to authorities. Xie, whose films include Woman Sesame Oil Maker, which won the Berlin Film Festival's Golden Bear prize in 1993 - has not made a film since 2000. He urged censors to give clearer rules on banned topics. Currently, China has no film rating system similar to those used in the UK in the US. Films must be deemed suitable for all audiences. Xie wrote that China's system "long ago lost its real social, economic, ideological and cultural significance". He added that it "has only become a corrupt black spot for controlling the prosperity of the cultural and entertainment industry, killing artistic exploration and wasting administrative resources". It has meant that many western films have been subject to cuts in order to be released. 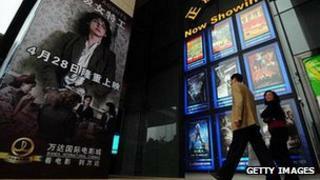 China also maintains a quota on the number of foreign movies that can be shown in cinemas. Just 20 a year are released, although the government has been trying to attract foreign studios to form joint ventures with China. In March, Disney rival DreamWorks unveiled plans to build a studio in Shanghai and the third film in the Iron Man series, starring Robert Downey Jr, was co-produced in China. Xie's last film was 2000's Song of Tibet but recently he has been working as artistic consultant on a movie about controversial military leader Lin Biao, who was killed in 1971 after a failed coup against Chairman Mao - founder of the Chinese communist party. The film also includes homosexuality as a theme and has been awaiting approval for four months. In his letter, Xie urged censors to "move from the current administrative review system to a rating system that allows for a self-governed and self-disciplined film industry, bound by legal restrictions and administrative supervision". Xie, who is a professor at Beijing Film Academy, said: "Our current review system is not the rule by law, but the rule by man, something that we wanted to end a long time ago." Earlier this month, Mo Yan - the winner of this year's Nobel Prize for Literature, voiced his support for censorship in China, comparing it with airport security checks. He said he hoped it "should have the highest principle". His Nobel prize was met with some criticism because of his close ties with the Chinese authorities.